Belfast, UK. 25 September, 2018. 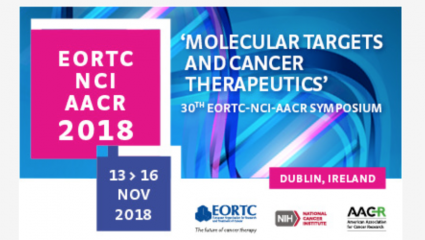 CV6 Therapeutics (CV6), a drug development company focused on the development and commercialisation of novel combination therapeutics for cancer, today announced they would be presenting details on CV6-168, a novel anticancer therapeutic at the 30th EORTC/AACR/NCI Molecular Targets and Cancer Therapeutics Symposium in Dublin, Ireland on 16th of November 2018. The abstract entitled “Development and Characterization of CV6-168, a Novel and Selective dUTPase Inhibitor that Enhances the Antitumour Efficacy of TS-targeted Therapies” will be presented by the CV6 Scientific Director, Dr. Peter Wilson in the “Drug Resistance and Modifiers” poster section on 16 November 2018. The presentation will detail the development and characterisation of CV6-168, a new anticancer therapeutic that is rationally-designed to significantly enhance the anticancer activity of drugs that block cancer cell growth by inhibiting the activity of the DNA synthesis enzyme called thymidylate synthase (TS). TS-targeted cancer therapeutics such as 5-fluorouracil (5-FU), capecitabine (Xeloda™) and pemetrexed (Alimta™) are among the most widely used anticancer therapies worldwide and are current mainstay therapies in thirteen of the top twenty cancers by incidence, including some of the most difficult to treat cancers such as gastrointestinal cancers, breast and lung cancers. CV6-168 is a selective inhibitor of the enzyme dUTPase, a gatekeeper protein that is present at high levels in cancer cells and protects cancer cell DNA from the detrimental misincorporation of uracil that would otherwise occur during treatment with a TS-targeted therapy. By blocking the protective action of dUTPase, CV6-168 significantly increases the DNA damage caused by TS-targeted therapies in cancer cells, leading to significantly enhanced cancer cell death. CV6-168 is the most advanced drug in the CV6 pipeline and is poised to enter clinical trials in 2019.